This program is currently available to AetnaBetter Health of Texas members. Due Date Plus for Aetna BetterHealth of Texas is a program that helps you keep track of yourpregnancy milestones, set reminders and get actions personalizedjust for you. Due Date Plus for Aetna Better Health of Texas isconnected to Aetna Better Health of Texas services. There's a lot to learn when you're pregnant! Due Date Plus forAetna Better Health of Texas helps you stay on track every step ofyour pregnancy. In addition to finding out about your Aetnabenefits during and after pregnancy, the program has a lot offeatures to help you have a healthy pregnancy. By connecting withAetna Better Health of Texas you will learn more about resourcesincluded in your health plan, such as the Aetna Better Health ofTexas, as well as the option to work one-on-one with a nursethroughout your pregnancy. Use this app to track your weight gain, look up symptoms, findout about health issues in pregnancy, keep a list of things to talkabout with your doctor, and set reminders so you won’t forget theimportant things to do when you’re pregnant. Get weekly updates with ultrasound videos showing what babieslook like at each stage of pregnancy. Daily updates give youimportant tips and inspirational quotes to stay positive andmotivated. Developed in conjunction with a board certified OB who has over15 years' experience taking care of pregnant women and theirbabies. Other contributors include nurse midwives and other medicalexperts. It’s easy to use – just enter your due date and birth date, andDue Date Plus sets up your pregnancy milestones. As you look upsymptoms, enter your health history and answer questions about howyou're feeling and things you're doing, Due Date Plus makes ahealthy pregnancy action plan with actions just for you. When you see something you want to talk to your doctor, midwifeor nurse about, you can add it to your Hot List so you can easilyremember it at your next appointment. These versions of the Android operating system have problems thatmight be cause your applications, including Due Date Plus, to crashunexpectedly. We encourage you to upgrade to Android 5.1.0 or 5.1.1as soon it is available from your carrier. *Alert for June and July 2015: Android 5.0.1and 5.0.1 users please see the alert at the bottom of thisdescription. There is an Android bug that may affect many of theapps you are running.For WYhealth: Wyoming Medicaid offers pregnant women a greatapp. Due Date Plus for WYhealth helps you keep track of yourpregnancy, set reminders and get actions personalized just for you.With weekly ultrasound videos and daily advice to help you getready for baby. The program is available for Wyoming Medicaidmembers, but if you live in Wyoming and are not eligible forMedicaid, you can still use WYhealth Due Date Plus to find outabout resources in Wyoming.This program is connected to a free 24/7 NurseLine, so that youcan get help quickly from WYhealth staff who are trained to helpMedicaid recipients with their health issues. You an also look up aBest Beginnings public health nurse program in your area. You canenter in your Wyoming zip code to find the closest Public Healthnurse in your area.There's a lot to learn when you're pregnant! WYhealth Due DatePlus helps you stay on track every step of your pregnancy. Inaddition to finding out about Medicaid benefits in Wyoming, theprogram has a lot of features to help anyone who is pregnant.Use this app to track your weight gain, look up symptoms, findout about health issues in pregnancy, keep a list of things to talkabout with your doctor, and set reminders so you won’t forget theimportant things to do when you’re pregnant.Get weekly updates with ultrasound videos showing what babieslook like at each stage of pregnancy. Daily updates give youimportant tips and inspirational quotes to stay positive andmotivated.Developed in conjunction with a board certified OB who has over15 years' experience taking care of pregnant women and theirbabies. Other contributors include nurse midwives and other medicalexperts.It’s easy to use – just enter your due date and birth date, andDue Date Plus sets up your pregnancy milestones. As you look upsymptoms, enter your health history and answer questions about howyou're feeling and things you're doing, Due Date Plus makes ahealthy pregnancy action plan with actions just for you.When you see something you want to talk to your doctor, midwifeor nurse about, you can add it to your Hot List so you can easilyremember it at your next appointment. from major health plans- BabyBoost relaxation toolDue Date Plus helps you keep track of all the things anexpectant mother needs to do - keep hydrated, take prenatalvitamins, eat well, stay active and communicate with your doctor ormidwife. And of course go to your prenatal appointments!Due Date Plus can help you understand symptoms or issues thatarise throughout your pregnancy, giving you real-time health adviceand a customized action plan. Your actions can include talking toyour health provider about an issue, calling a resource in yourarea, enrolling in a pregnancy management program offered by yourhealth plan, or using one of Due Date Plus' in-app tools to checkyour weight or take time to relax.We welcome your comments and suggestions - please email us [email protected]: Wyoming, Medicaid, WYhealthAlert for Android 5.0.1 and 5.0.2 Users:These versions of the Android operating system have problems thatmight be cause your applications, including Due Date Plus, to crashunexpectedly. We encourage you to upgrade to Android 5.1.0 or 5.1.1as soon it is available from your carrier. This program is currently available to AetnaBetter Health of Texas members. Due Date Plus for Aetna BetterHealth of Texas is a program that helps you keep track of yourpregnancy milestones, set reminders and get actions personalizedjust for you. Due Date Plus for Aetna Better Health of Texas isconnected to Aetna Better Health of Texas services.There's a lot to learn when you're pregnant! Due Date Plus forAetna Better Health of Texas helps you stay on track every step ofyour pregnancy. In addition to finding out about your Aetnabenefits during and after pregnancy, the program has a lot offeatures to help you have a healthy pregnancy. By connecting withAetna Better Health of Texas you will learn more about resourcesincluded in your health plan, such as the Aetna Better Health ofTexas, as well as the option to work one-on-one with a nursethroughout your pregnancy.Use this app to track your weight gain, look up symptoms, findout about health issues in pregnancy, keep a list of things to talkabout with your doctor, and set reminders so you won’t forget theimportant things to do when you’re pregnant.Get weekly updates with ultrasound videos showing what babieslook like at each stage of pregnancy. Daily updates give youimportant tips and inspirational quotes to stay positive andmotivated.Developed in conjunction with a board certified OB who has over15 years' experience taking care of pregnant women and theirbabies. Other contributors include nurse midwives and other medicalexperts.It’s easy to use – just enter your due date and birth date, andDue Date Plus sets up your pregnancy milestones. As you look upsymptoms, enter your health history and answer questions about howyou're feeling and things you're doing, Due Date Plus makes ahealthy pregnancy action plan with actions just for you.When you see something you want to talk to your doctor, midwifeor nurse about, you can add it to your Hot List so you can easilyremember it at your next appointment.Alert for Android 5.0.1 and 5.0.2 Users:These versions of the Android operating system have problems thatmight be cause your applications, including Due Date Plus, to crashunexpectedly. We encourage you to upgrade to Android 5.1.0 or 5.1.1as soon it is available from your carrier. This app is currently available to Cigna® medical customers only.The Cigna Healthy Pregnancy app offers you an easy way to track andlearn about your pregnancy. It also provides support after baby hasarrived! There's a lot to keep track of when you're pregnant. TheCigna Healthy Pregnancy app can help make it simple. Use it totrack important dates, learn about your baby’s development and stayon top of your health during every stage of your pregnancy. Usethis app to: • Look up and learn about health symptoms and issuesduring pregnancy. • Track your weight gain. • Keep count of yourbaby's kicks. • Create a list of things to talk about with yourdoctor, and set reminders. • Watch videos about your baby’s weeklydevelopment. 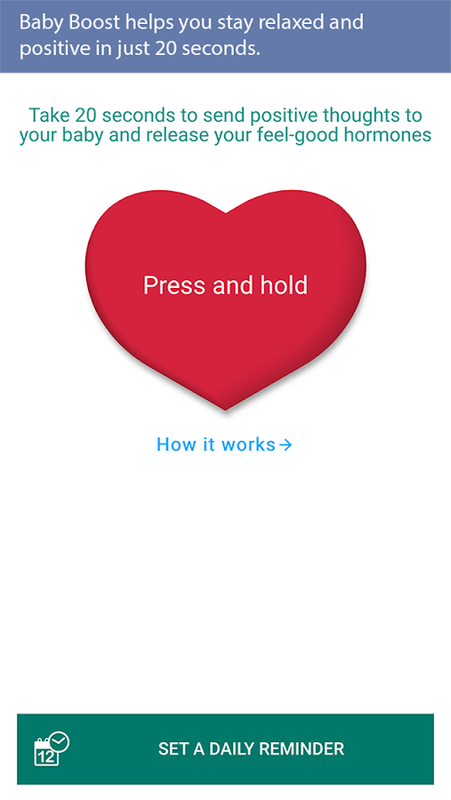 • Feel connected to your baby with the Baby Boostrelaxation tool. • Get daily updates with important tips andinspirational quotes to stay positive and motivated. This app isdesigned to give you the support you need to actively manage yourpregnancy and help keep you and your baby as healthy as possible.You also can use it to find local resources and learn about Cignaprograms you may be eligible for, such as the Cigna HealthyPregnancies, Healthy Babies® program. Just enter your due date andmyCigna® user ID and password to get started. Key Features: •Week-by-week updates • Due Date Calculator • Weight Gain Calculator• Pregnancy and postpartum milestones • Calendar to track medicalappointments • Diaper, feeding, and growth trackers for your babyafter they’re born The Cigna Healthy Pregnancy app providesinformation and tools to help you have a healthier pregnancy. Tomake the app available to you and other customers, Cigna enteredinto a service agreement with the developer, Wildflower Health. Thecontent for the Cigna Healthy Pregnancy app was developed inconjunction with a board-certified OB-GYN who has over 15 years'experience caring for pregnant women and their babies. Othercontributors include nurse midwives and other medical experts.Please send your comments and suggestions to:[email protected] The Cigna Healthy Pregnancy app isfor educational purposes only. Medical advice is not provided. Donot rely on information in this app as a tool for self-diagnosis.Always consult your doctor for appropriate examinations, treatment,testing, and care recommendations. In an emergency, dial 911 orvisit the nearest hospital. All Cigna products and services areprovided exclusively by or through operating subsidiaries of CignaCorporation, including Cigna Health and Life Insurance Company,Connecticut General Life Insurance Company, Cigna BehavioralHealth, Inc., Cigna Health Management, Inc., and HMO or servicecompany subsidiaries of Cigna Health Corporation. The Cigna name,logo, and other Cigna marks are owned by Cigna IntellectualProperty, Inc. As to Cigna content/properties, © 2018 Cigna. Allrights reserved. *Note: For CHIP and Medicaid members, downloadDue Date Plus for Aetna Better Health *This program is currently available under a pilot program toAetna members and their dependents from several Northern Californiacompanies. 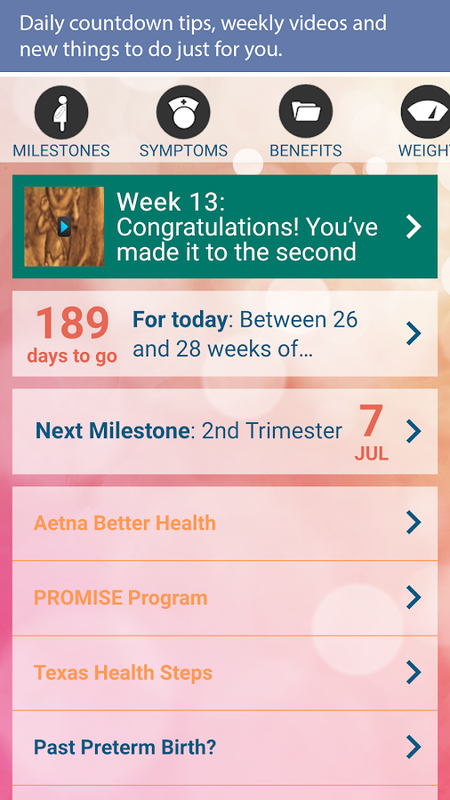 If your company does not currently participate but youwould like us to notify you by email when the program becomesavailable, please send an email to [email protected] Date Plus for Aetna members is a program that helps you keeptrack of your pregnancy milestones, set reminders and get actionspersonalized just for you. Due Date Plus for Aetna members isconnected to Aetna's services such as 24/7 nurse support and theBeginning Right maternity program.There's a lot to learn when you're pregnant! Due Date Plus forAetna members helps you stay on track every step of your pregnancy.In addition to finding out about your Aetna benefits during andafter pregnancy, the program has a lot of features to help you havea healthy pregnancy. By connecting with Beginning Right you willlearn more about resources included in your health plan, such asthe Smoke-free-Moms-to-be program and the 39-week initiative, aswell as the option to work one-on-one with a nurse throughout yourpregnancy.Use this app to track your weight gain, look up symptoms, findout about health issues in pregnancy, keep a list of things to talkabout with your doctor, and set reminders so you won’t forget theimportant things to do when you’re pregnant.Get weekly updates with ultrasound videos showing what babieslook like at each stage of pregnancy. Daily updates give youimportant tips and inspirational quotes to stay positive andmotivated.Developed in conjunction with a board certified OB who has over15 years' experience taking care of pregnant women and theirbabies. Other contributors include nurse midwives and other medicalexperts.It’s easy to use – just enter your due date and birth date, andDue Date Plus sets up your pregnancy milestones. As you look upsymptoms, enter your health history and answer questions about howyou're feeling and things you're doing, Due Date Plus makes ahealthy pregnancy action plan with actions just for you.When you see something you want to talk to your doctor, midwifeor nurse about, you can add it to your Hot List so you can easilyremember it at your next appointment. - BabyBoost relaxation toolDue Date Plus helps you keep track of all the things anexpectant mother needs to do - keep hydrated, take prenatalvitamins, eat well, stay active and communicate with your doctor ormidwife. And of course go to your prenatal appointments!Due Date Plus can help you understand symptoms or issues thatarise throughout your pregnancy, giving you real-time health adviceand a customized action plan. Your actions can include talking toyour health provider about an issue, calling a resource in yourarea, enrolling in a pregnancy management program offered by yourhealth plan, or using one of Due Date Plus' in-app tools to checkyour weight or take time to relax.We welcome your comments and suggestions - please email us [email protected] for Android 5.0.1 and 5.0.2 Users:These versions of the Android operating system have problems thatmight be cause your applications, including Due Date Plus, to crashunexpectedly. We encourage you to upgrade to Android 5.1.0 or 5.1.1as soon it is available from your carrier. Este programa está disponible actualmentemiembros de Aetna Better Health of Texas. El programa Mi Embarazopara Aetna Better Health of Texas te ayuda a estar al día con lasetapas claves de tu embarazo, programar recordatorios y recibir unplan de acción con objetivos personalizados. 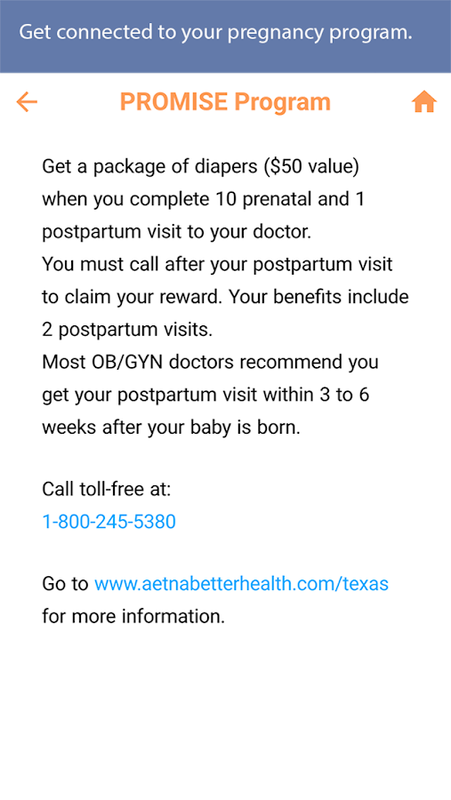 Mi embarazo para AetnaBetter Health of Texas funciona conjuntamente con algunos serviciosde Aetna Better Health of Texas, como la asistencia de enfermeras yel programa Aetna Better Health of Texas.¡Hay tanto que aprender sobre el embarazo! Mi Embarazo paraAetna Better Health of Texas te ayuda a estar al día con cada pasode tu embarazo. Además de ofrecerte los beneficios de maternidad deAetna, el programa contiene muchísima información para ayudarte atener un embarazo sano. A través del programa Aetna Better Healthof Texas, obtendrás información sobre los recursos que te ofrece tuplan de seguro médico, como Aetna Better Health of Texas, así comola oportunidad de recibir la ayuda personalizada de una enfermeradurante tu embarazo.Usa esta aplicación para hacerle seguimiento a tu peso, buscarsíntomas, informarte sobre los problemas médicos relativos alembarazo, mantener una lista de preguntas para el médico yprogramar alarmas que te recuerden todo lo que debes hacer durantela maternidad.Obtén videos semanales con información sobre el desarrollo de tubebé en cada etapa del embarazo. Los consejos diarios te ofreceninformación importante y frases inspiradoras para mantenertepositiva y motivada.Esta aplicación ha sido diseñada con la colaboración de unobstetra certificado con más de 15 años de experiencia al cuidadode madres embarazadas y sus bebés. Otros colaboradores incluyenparteras certificadas y expertos en el sector de la salud.¡Es fácil de usar! Ingresa la fecha prevista para el parto y tufecha de nacimiento, y Mi Embarazo configurará las etapas claves detu embarazo. Al buscar síntomas, ingresar tu historial médico yresponder a preguntas sobre tus sentimientos y acciones, MiEmbarazo elabora un plan de acción con objetivos específicos paraayudarte a vivir un embarazo sano.This program is currentlyavailable members of Aetna Better Health of Texas. My Pregnancyprogram for Aetna Better Health of Texas helps you keep up with thekey stages of your pregnancy, schedule reminders and receive apersonalized action plan objectives. My pregnant to Aetna BetterHealth of Texas works in conjunction with some services AetnaBetter Health of Texas, such as nursing care and Aetna BetterHealth of Texas program.So much to learn about pregnancy! My Pregnancy for Aetna BetterHealth of Texas helps you keep up with every step of yourpregnancy. Besides offering maternity benefits Aetna, the programcontains a wealth of information to help you have a healthypregnancy. Through the Aetna Better Health of Texas program, youget information about resources offered by your health plan, likeAetna Better Health of Texas, as well as the opportunity to receivepersonalized help from a nurse during your pregnancy.Use this application to track your weight, look for symptoms,inform about medical problems related to pregnancy, keep a list ofquestions for the doctor and set alarms to remind you what youshould do during maternity.Get weekly videos with information about the development of yourbaby at each stage of pregnancy. Daily tips will provide importantinformation and inspirational quotes to keep positive andmotivated.This application has been designed in collaboration with acertified obstetrician with over 15 years experience in the care ofpregnant mothers and their babies. Other collaborators includecertified midwives and experts in the health sector.It is easy to use! Enter your due date and your date of birth,and My Pregnancy configure the key stages of your pregnancy. Whenlooking for symptoms, enter medical history and answer questionsabout your feelings and actions, my pregnancy develops an actionplan with specific objectives to help you live a healthypregnancy. Start Smart for Your Baby by LouisianaHealthcare Connections offers pregnant women a great new app. StartSmart for Your Baby helps you keep track of your pregnancy, setreminders and get actions personalized just for you. With weeklyultrasound videos and daily advice to help you get ready for baby.This app is connected to a free 24/7 NurseLine, so that you canget help quickly from Start Smart for Your Baby staff.There's a lot to learn when you're pregnant! Start Smart forYour Baby helps you stay on track every step of your pregnancy.Use this app to track your weight gain, look up symptoms, findout about health issues in pregnancy, keep a list of things to talkabout with your doctor, and set reminders so you won’t forget theimportant things to do when you’re pregnant.Get weekly updates with ultrasound videos showing what babieslook like at each stage of pregnancy. Daily updates give youimportant tips and inspirational quotes to stay positive andmotivated.Developed in conjunction with a board certified OB who has over15 years' experience taking care of pregnant women and theirbabies. Other contributors include nurse midwives and other medicalexperts.It’s easy to use – just enter your due date and birth date, andStart Smart for Your Baby sets up your pregnancy milestones. As youlook up symptoms, enter your health history and answer questionsabout how you're feeling and things you're doing, Start Smart forYour Baby makes a healthy pregnancy action plan with actions justfor you.When you see something you want to talk to your doctor, midwifeor nurse about, you can add it to your Hot List so you can easilyremember it at your next appointment. from major health plans- BabyBoost relaxation toolStart Smart for Your Baby helps you keep track of all the thingsan expectant mother needs to do - keep hydrated, take prenatalvitamins, eat well, stay active and communicate with your doctor ormidwife. And of course go to your prenatal appointments!Start Smart for Your Baby can help you understand symptoms orissues that arise throughout your pregnancy, giving you real-timehealth advice and a customized action plan. Your actions caninclude talking to your health provider about an issue, calling aresource in your area, enrolling in a pregnancy management programoffered by your health plan, or using one of Start Smart for YourBaby's in-app tools to check your weight or take time to relax.We welcome your comments and suggestions - please email us [email protected] for Android 5.0.1 and 5.0.2 Users:These versions of the Android operating system have problems thatmight be cause your applications, including Due Date Plus, to crashunexpectedly. We encourage you to upgrade to Android 5.1.0 or 5.1.1as soon it is available from your carrier. LifeMap Due Date Plus helps you keep track ofyour pregnancy milestones, set reminders and get actionspersonalized just for you. LifeMap Due Date Plus is connected toLifeMap's services such as LifeMap Short Term Disability and memberdiscounts.There's a lot to learn when you're pregnant! LifeMap Due Date Plushelps you stay on track every step of your pregnancy. In additionto finding out about your LifeMap benefits during pregnancy. theprogram has a lot of features to help you stay healthy and connectwith resources when an issue comes up.Use this app to track your weight gain, look up symptoms, find outabout health issues in pregnancy, keep a list of things to talkabout with your doctor, and set reminders so you won’t forget theimportant things to do when you’re pregnant.Get weekly updates with ultrasound videos showing what babies looklike at each stage of pregnancy. Daily updates give you importanttips and inspirational quotes to stay positive and motivated.Developed in conjunction with a board certified OB who has over 15years' experience taking care of pregnant women and their babies.Other contributors include nurse midwives and other medicalexperts.It’s easy to use – just enter your due date and birth date, and DueDate Plus sets up your pregnancy milestones. Under the Symptomssection, you can learn about past health conditions and get moreinformation about how you're feeling and things you're doing, DueDate Plus makes a healthy pregnancy action plan with actions justfor you.When you see something you want to talk to your doctor, midwife ornurse about, you can add it to your Hot List so you can easilyremember it at your next appointment. - BabyBoost relaxation toolDue Date Plus helps you keep track of all the things an expectantmother needs to do - keep hydrated, take prenatal vitamins, eatwell, stay active and communicate with your doctor or midwife. Andof course go to your prenatal appointments!Due Date Plus can help you understand symptoms or issues that arisethroughout your pregnancy, giving you real-time health advice and acustomized action plan. Your actions can include talking to yourhealth provider about an issue, calling a resource in your area,enrolling in a pregnancy management program offered by your healthplan, or using one of Due Date Plus' in-app tools to check yourweight or take time to relax.We welcome your comments and suggestions - please email us [email protected] for Android 5.0.1 and 5.0.2 Users:These versions of the Android operating system have problems thatmight be cause your applications, including Due Date Plus, to crashunexpectedly. We encourage you to upgrade to Android 5.1.0 or 5.1.1as soon it is available from your carrier. My Benefits by Aetna - Now you can exploreyour benefit options on the go!Please Note: Aetna has other member service apps that you may findhelpful after you enroll.Choosing benefit plans for you and your family is a big decision.My Benefits can help.FEATURES:View benefit plansView and learn more about the Aetna benefit plans being offered toyou by your employer. (You may also be offered benefits from otherinsurance companies that are not included in this app. )Compare benefit plansCompare similar Aetna benefit plans side-by-side, making yourdecision process easier.Enrollment detailsReview instructions on how to enroll and access important Aetnacontact information.Aetna is the brand name used for products and services provided byone or more of the Aetna group of subsidiary companies, includingAetna Life Insurance Company and its affiliates (Aetna).This material is for information only. Health benefits and healthinsurance plans contain exclusions and limitations. Information isbelieved to be accurate as of the production date; however, it issubject to change. Choosing a health benefits or insuranceplanfor you and your family is a big decision. The Plan Selection&Cost Estimator tool can help. If your employer offers Aetna®alongwith this tool, it will help you estimate costs for the yearahead.It’ll also help you compare plan costs side by side. Thatway, youcan make a confident decision.Estimate your costsJust select the medical plan and services you and your familymayneed in the coming year. The estimate factors in the averagecostof the services you select. It’ll also recommend preventivecarefor each covered family member.Compare plansSelect the plans you want to compare. Then view the results inaneasy-to-read chart. For each plan, you'll see how much:• You’ll contribute from your paycheck (premium)• You may pay out of pocket next year• Your health plan pays for expected health care services,includingpreventive careThat's it. To get started, download the Plan Selection &CostEstimator tool.Aetna is the brand name used for products and servicesprovidedby one or more of the Aetna group of subsidiarycompanies,including Aetna Life Insurance Company and itsaffiliates(Aetna).This material is for information only. Health benefits andhealthinsurance plans contain exclusions and limitations. Estimatedcostsnot available in all markets. The tool gives you an estimateofwhat you would owe for a particular service based on your planatthat very point in time. Actual costs may differ from theestimateif, for example, claims for other services are processedafter youget your estimate but before the claim for this serviceissubmitted. Or, if the doctor or facility performs adifferenceservice at the time of your visit. HMO members can onlylook upestimated costs for doctors and outpatient facilityservices.Information is believed to be accurate as of theproduction date;however, it is subject to change.